One Left! 22 Stitches, Built In Buttonhole, Auto Needle Threader, Easy Top Drop In Bobbin, 7 Piece Metal Feed Metal Dogs, LED Light, Left and Center Needle Positions for Straight Stitch. Simply lower the lever and turn it back and forth. This single action makes it easy to thread the needle. Stitch patterns can be selected by the large, easy to operate dial. The Reverse Feed Lever is also conveniently larger for simple operation. Brightens the needle entry area. LED light will not heat up even during long operations. Buttonholes can be sewn neatly with 4 easy steps. 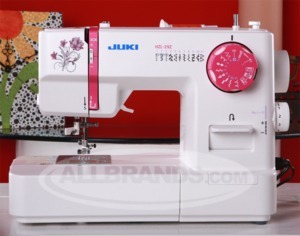 It is simple to prepare the bobbin thread and to clean the hook area. The remaining amount of bobbin thread is visible through the transparent cover. From light-weight material to denim. 2 extra Feed Dogs are located in front of the needle entry hole. With the 7-point feed dog the machine feeds any light weight to heavy weight materials consistently. The accessory box slides off for free arm sewing. Standard accessory parts can be neatly stored in the box. Push the black button at the presser foot and make it parallel to the throat plate. This makes it easy to start sewing multiple layers of fabric or overlapped materials. Zigzag width can be adjusted by simply turning the Stitch Selection Dial. For straight stitches, either the left or center needle position can be selected.